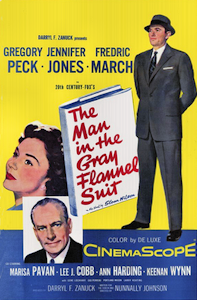 The Man in the Grey Flannel Suit is a movie starring Gregory Peck and Jennifer Jones. Frederic March also plays a leading role and figures prominently in the subject of this post. The movie is based on the 1955 novel by Sloan Wilson, about the American search for purpose in a world dominated by business. It should also be said that it’s about the choices a man and his wife must make about doing the “most right thing” in a given circumstance. The final scenes say more about what makes up a solid relationship than any I’ve seen in movies lately. Back to the subject, the title of this post, there is a scene in which fully twelve seconds pass without a word between the two main characters, Tom Rath and Ralph Hopkins. This is powerful stuff in a dialog driven movie. The viewer has an opportunity to fully absorb what has just transpired in a scene where our hero has taken a great risk by simply stating his honest opinion. This is no spoiler alert. There is nothing more I have to say about this wonderful movie, except, if you haven’t seen it, maybe you will. If you are a nine to fiver in this world, or if you are a business owner, you may have a deeper appreciation for your place in the scheme of things. This is a movie that is over two and a half hours in length, so there is some time investment involved in getting this edification. Enjoy it as I did, with several cups of coffee and breakfast made by a caring spouse. Thank you, Margaret, for your unending love of movies!